We will presume that you have completed the two previous steps with the guides: "DXG IP Set-up" and "Ceiling Installation". Now for the fun part. Take a reading of each after the room has been calibrated, then mark it as a baseline. Compare those to the baseline. A DCP with audio and/or picture is played from the media server, through the projector and/or the sound system. The DXG is "Armed", in order to run a sequence file when the proper DCP is played. A human-readable file known as an "xml results" file is created and placed into an directory appropriate for the auditorium. This xml file contains metadata that includes - among other things - the date, time and auditorium name of the reading. This directory can be polled, and the data sent to an appropriate SQL database table. 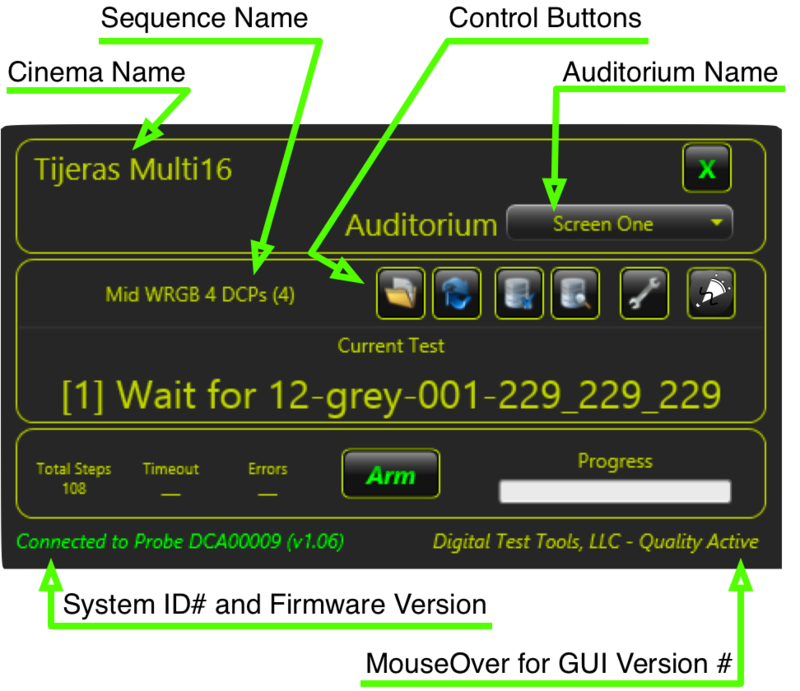 The picture above shows a Guardian user interface ready to take a reading of Auditorium Screen One at the Tijeras Cinemas 16 Multiplex. The sequence will run through white, red, green and blue slides in the Mid-range; that is, several slides of each color, from 80% saturation to 30% saturation will appear on the screen for 1 second each and a reading of their characteristics will be taken and stored for review. 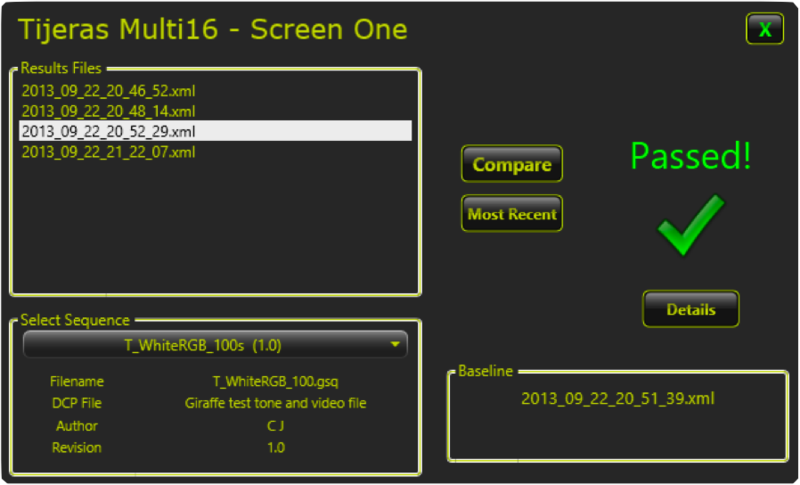 The High DCP cover the top 15% in high detail - 1/2% steps. That is, one-half of 1% of 4096 steps is about 20.5 steps. Some slides sets will show numbers descending in that magnitude. Because people are more familiar with seeing R,G and G numbers in units of 256, many slides sets will show the numbers descending in 8-bit nomenclature. In this case, the numbers descend in steps that appear smaller. 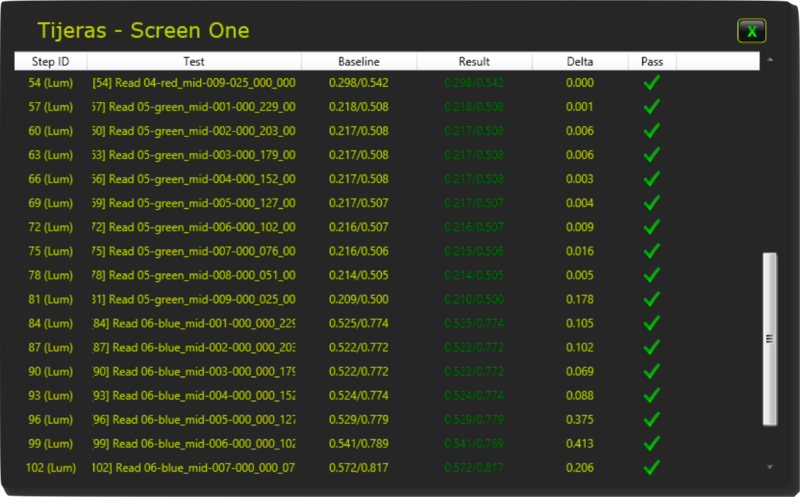 The Mid DCP descends in 5% steps from 80% to 30%. The Low DCP descends through each color down to black, again in approximately 1/2% steps. The sync slides are white instead of black in the Low- set. Audio sequences are much the same; three tones are played into each speaker at various frequencies – 250Hz, 1000Hz and 8000Hz, except for the LFE channel which has 50Hz, 100Hz and 250Hz. The L, C, R channels are played at 85dB when a properly calibrated Audio Processor is set at 7. The surrounds are played at 82dB and the LFE is played at 20dB down. 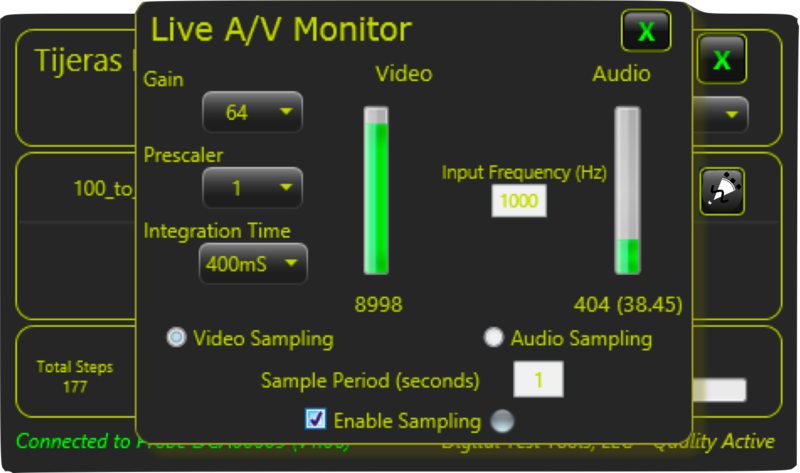 This DCP is played to establish audio level as well as THD (Total Harmonic Distortion). This DCP also plays certain pairs of speakers to establish their phase characteristics. There is a 2nd DCP that plays a 'click' to each speaker which establishes whether each speaker is playing from the correct source. Preparation: Make DCP Playlists and load DXG Programs to your Windows computer. Finally, let's run the thing, eh?